Cobourg Peninsula & Croker Is. - Upon formation, what should be the name of this State? Who would be the Premier? Who would be the two Senators who represent this State? Who would be the Senator that represents the super-State for the Arnhem Land? The CSIRO has regions for projecting the impact of Climate Change. See https://www.climatechangeinaustralia.gov.au/en/climate-projections/futur... 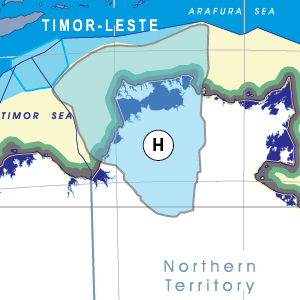 This state, Van Dieman State (H), is one of the clear projections in a CSIRO cluster called "Monsoon North region". CSIRO's Monsoon North region coincides exactly with BloggerMe's K,J,H,G,F,E,D,C,AF.